On Monday, we drove down to Coronado and rented bikes. On Tuesday, I biked to work, following the above path. It's a lot easier in California, what with the bike lanes and such. I also biked to work on substantially the same path the following two days -- I'm not going to record any more trips to work unless I take a different way. I have one idea for that, but the path depicted above has been easy enough -- about 3.5 miles each way, no incredibly awful stretches of uphill biking. I've had three more bike rides in the past week. 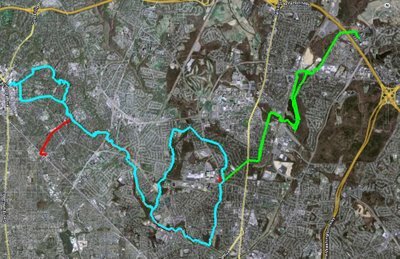 Last weekend, I took another trip to Silver Spring (light blue path). On the way there, I tried a partial shortcut. While the full shortcut will undoubtedly save 1.5-2 miles, the partial shortcut was longer. On the way back, I went the "long" way and didn't get lost, and it was only 8.4 miles. The full shortcut should bring this under 7. 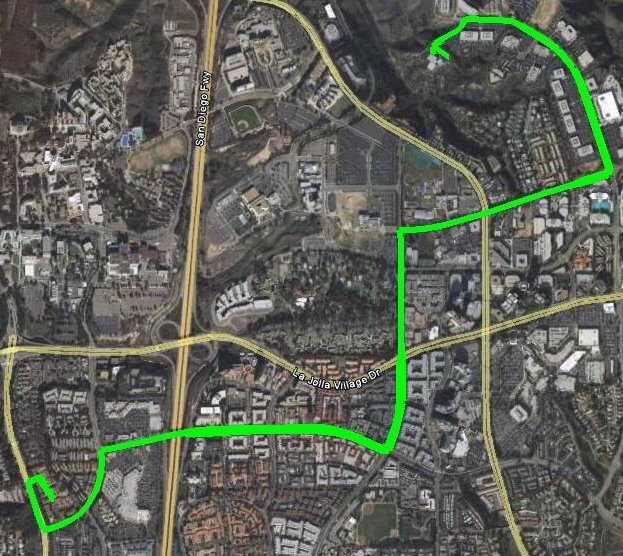 On Thursday, I was testing out the start of a path to work, and I ended up making it as far as the Greenbelt Marriott (green path). The on-road biking was a little bit dicey. 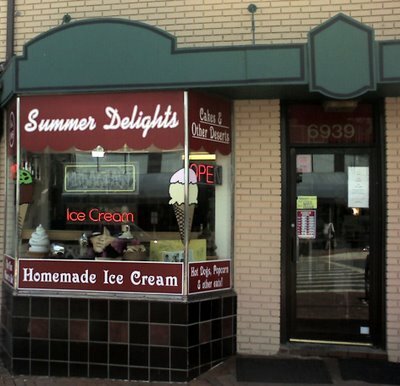 I think next time I can go via Rhode Island Avenue and have a calmer experience. On the way, there, I saw a deer cross the Indian Creek Trail and head into the Indian Creek. 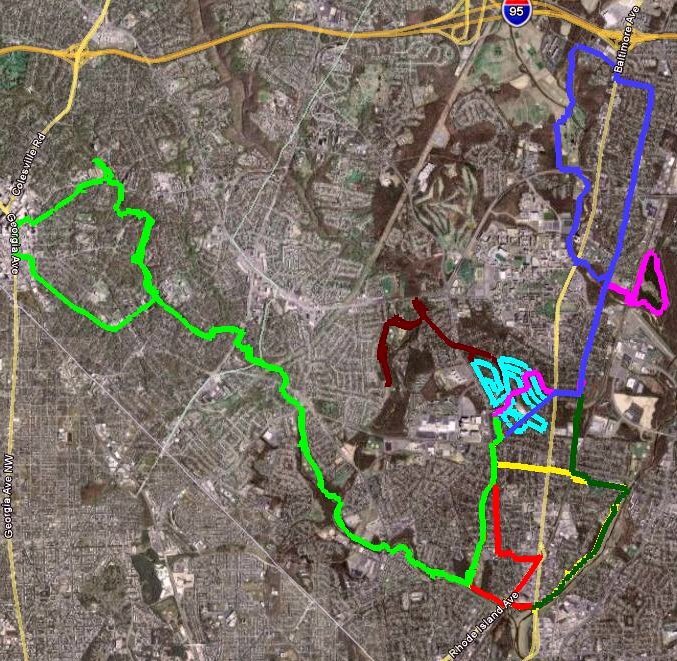 Today I decided to head to Takoma Park (red path, mostly overlapping with the light blue path). That ended up being 7.6 miles, not incredibly shorter than the Silver Spring trip. I enjoyed some ice cream and then headed back. I like the above map as a way of summarizing a bunch of bike rides at once. I've continued logging my trips at Everytrail; links below. On the 2nd, we rode to the bike shop and back (light red path). On the way, I popped a tire, which led me to get nice new tires on my bike. On the 4th, I inadvertently rode to Silver Spring (light green path). I was aiming for Takoma Park, but I took a wrong turn (yes, even with the GPS receiver). At slightly more than 20 miles, this is my longest trip yet. At least I got some good hummus out of it. 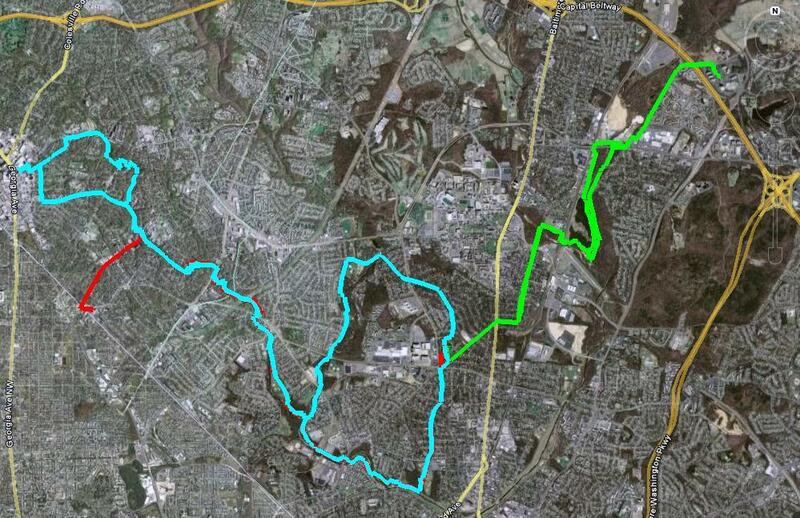 On the 5th, I slowed down to a 10-mile ride linking the Paint Branch Trail and the Trolley Trail (dark blue path). Unfortunately, there's no good connection, so I probably won't try this one again soon. On the 6th, I rode to and around Lake Artemesia (pink path). On the 7th, I stuck to University Park; it was kinda boring (light blue path). On the 8th, Christina and I looked for a shortcut to Takoma Park and Silver Spring (dark red path). On the 9th, I headed to the Riverdale Park Farmers Market (dark green path). On the 10th, I biked to La Fondita, a nearby authentic Mexican restaurant (yellow path). Last Wednesday, we went to Arrow Bicycle to get a replacement inner tube, a full sized bike pump and other accessories. The picture is of the bike pump strapped to Christina's bike rack, since that was the only good way to transport it home. Thursday morning, I had a quick ride out to Lake Artemesia. Saturday morning, I rode to the end of the Paint Branch Trail (and saw a turtle). Sunday, we saw a tree dedicated to our former mayor, and looked at some nice houses in town. Monday, I rode out to the store and brought back some food (useful biking!). Tuesday, I explored the Indian Creek Trail and other new routes.